Pregnancy – A dream for every woman who wants to live the graceful experience of womanhood. But sometimes age associated infertility poses a barrier to achieve her dream of motherhood. Fertility naturally declines as women get older. Age is the single biggest factor affecting a woman’s chance to conceive and have a healthy baby. Generally, fertility begins to turn down in late 20s or early 30s and falls rapidly after the age of 35. Antimullerian hormone (AMH) and follicle stimulating hormone (FSH) are potential markers of women fertility. These hormones reflected the ovarian function and monitoring the fertility. Thus, an elevated FSH and a low AMH level is associated with reduced pregnancy rates, especially in women over the age of 35 years. Currently, numerous infertility therapies (mainly Assisted Reproductive Technologies –ART) offer many options for women willing to get pregnant after the age of 30. But again infertility treatments are age dependent. With the advanced age i.e. 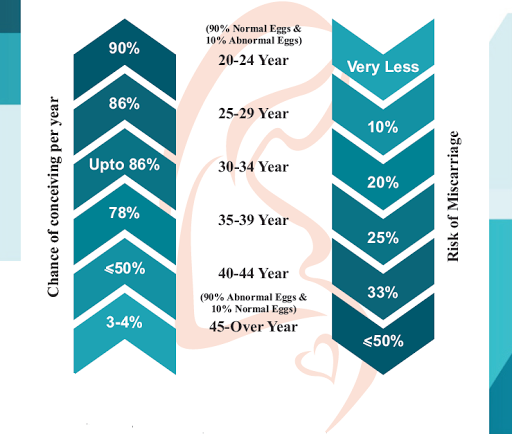 after 40 -43 age, woman’s eggs quality and quantity begins to reduce. In this case, woman’ chance to getting pregnant has been enhanced by donor eggs. It is important to undergo counselling with infertility specialist and obtains information on appropriate testing and best suited infertility treatment. So, earlier women get started infertility treatment (link to appointment), the greater possibility of success. Maternal Fetal Medicine: Practice and Principles. Creasy and Resnick, eds.W.B. Saunders, Philadelphia, PA. 1994:71. Reproduced with permission. P.R. Gindoff and R. Jewelewicz. Reproductive potential in the older woman. Fertility and Sterility. 46:989;1986.